Horace-Scope is the third album by Horace Silver’s classic quintet — or most of it, actually, as drummer Louis Hayes was replaced by Roy Brooks starting with this session. The rhythmic drive and overall flavor of the group are still essentially the same, though, and Horace-Scope continues the tight, sophisticated-yet-swinging blueprint for hard bop pioneered on its two classic predecessors. The program is as appealing as ever, and even though not as many tunes caught on this time — at least not on the level of a “Juicy Lucy” or “Sister Sadie” — Silver’s writing is tuneful and tasteful. The best-known selections are probably the lovely closing number “Nica’s Dream,” which had been around for several years but hadn’t yet been recorded on a Silver LP, and the genial, laid-back opener “Strollin’.” But really, every selection is full of soulful grooves and well-honed group interplay, the qualities that made this band perhaps the top hard bop outfit of the early ’60s. 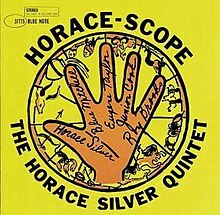 Silver was in the midst of a hot streak that wouldn’t let up for another few years, and Horace-Scope is another eminently satisfying effort from that period. Recorded July 8 (tracks 1-3) & July 9 (tracks 4-7), 1960.